A young San Antonio Rampage fan is very committed to watching his team play in person. Five-year-old James Evans may already like sports too much. 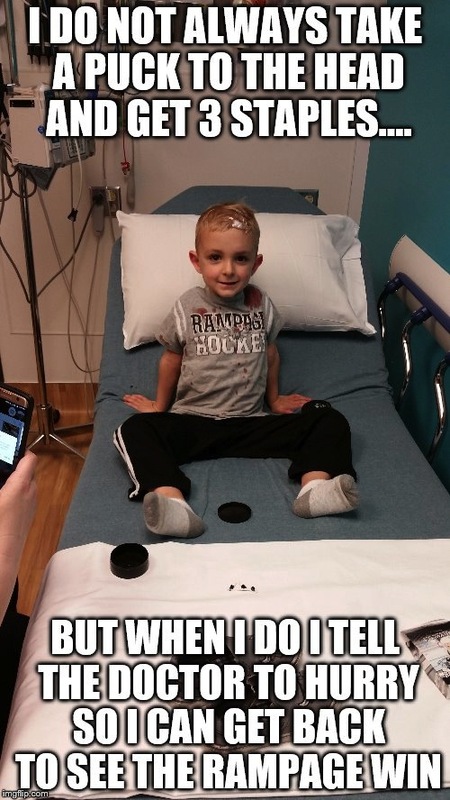 Young James was watching his San Antonio Rampage on Easter when he was hit in the head with a hockey puck during the game. Evans had to be taken to the the emergency room for stitches—but the young whippersnapper was back in his seat by overtime to watch the Rampage win. “He told the doctor ‘Can you hurry so I can go back to the game,” David Evans, James’s father, said. James got staples in his head—let me emphasize, STAPLES IN HIS HEAD—but returned to the arena with under a minute to go in the third period, and then watched the overtime period where the Rampage secured the win. Look at all that blood! I would call it a night if I stubbed my toe while looking for the TV remote. James looks like he rolled around in a crime scene before heading to the rink. And this wasn’t even an NHL game, the kid was really dedicated to minor league hockey. He’s too young to care this much. Needless to say, I’m terrified of who he’ll become.